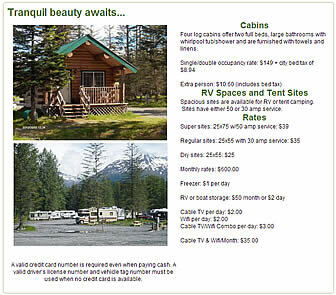 Are you the owner of Bear Creek Cabins and RV Park? Did you know that you can convert this page to a complete listing of your services today for nearly nothing? Put your listing in front of thousands of visitors planning their trip to Alaska. Add your own coupons, pictures, services and more. Contact us today. Bear Creek RV Park in Valdez AK. Visiting Valdez Alaska? There's lots to see and do in the most well known seaport in all of Alaska; the terminus of the famous Alaska Pipeline and an important fishing and sightseeing location too.